This is the ‘Premium’ version of the DT990s (which we awarded three stars many moons ago) and comes in three different impedance levels: 32, 250 and 600ohms. While the 32ohm model is more suited for smartphones and portable players, the other higher impedance versions are better suited to hi-fi use with a headphone amp like Audiolab’s M-DAC. We use this pairing with our 250ohm review set and are impressed with the results – after they’ve been run-in extensively, mind. Give them anything less than 72 hours to warm-up and music is tainted by an uncomfortable trebly edge. When the edge is taken off, though, the Beyerdynamics have a likeable, even temperament. The mid-range is clear and comes through a rich bass and well judged treble. The Beyers fill their spacious and airy presentation with detail and display balance too, having no trouble uncovering the small narrative quips in Eminem’s The Marshall Mathers LP2 album. As well as capturing the natural buoyancy of Preservation Hall Jazz Band’s Come With Me, they have no problem painting the band’s stage arrangement, with trumpets, clarinets and pianos well placed. Put them through their paces with Jack White’s Lazaretto and the Beyers tear through the track’s high tempo, with a good sense of texture too. A lack of dynamic punch compared to class-leading rivals – like the slightly pricier B&W P7s (£330) – is their only real snag; the P7s hit harder in bassy electric riffs and drums, bringing a bite that makes them truly top performers. One other thing to consider is that the ribbed outer body of the ear cups let sound seep through its gaps – the ‘semi’ open design will share your playlist publicly if you choose to take these on your travels. 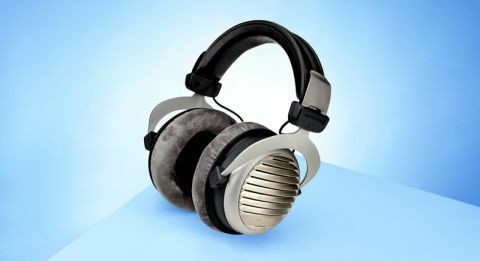 However, if you regularly have lengthy listening sessions to your music, you will appreciate the work Beyerdynamic has put into their build: (replaceable) grey velour ear pads epitomise comfort, fitting snugly around your ears, while gently clasping your head with the right amount of snugness. The spring steel headband means the ear cups can stretch out almost horizontal, too, so you will be hard-pushed to find a head size it doesn’t accommodate. What’s more, the thick leather-type cushioning underneath makes the band feel inconspicuous. Offering a hugely detailed, open sound and unquestionable comfort, the DT 990 Premiums have a lot going for them. If you can live with a loss in bass punch, these headphones can sit proudly next to your system.